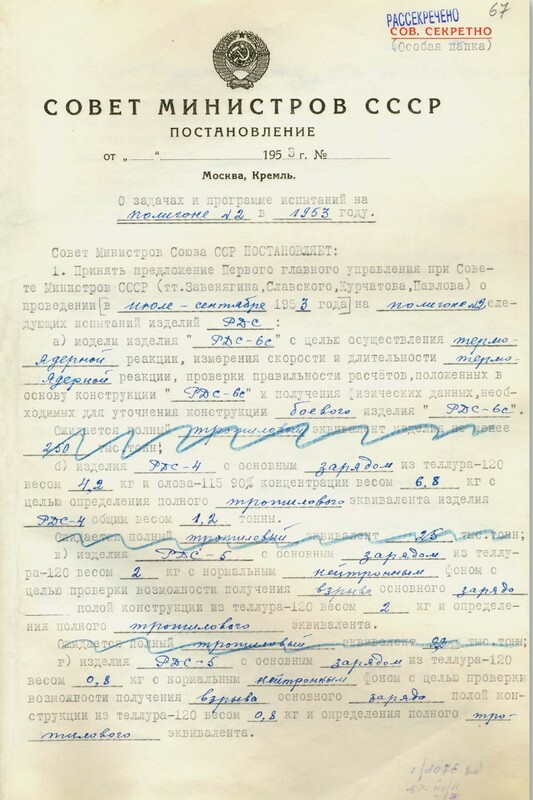 Among other things, the document provides some details about the amounts of fissile materials used in the first Soviet nuclear weapons. Below is my translation of the document. It is clearly marked as "Declassified" on top of its original "Top Secret/Special Folder" classification. As it was the case with most documents at that level of secrecy, some words were written in by hand - the information was too sensitive to entrust it to typists. The hand-written words are in italics. These precautions notwithstanding, the document does not refer to fissile materials by their actual names - plutonium is "tellurium-120" and uranium is "tin-115" (this is a bit strange - in earlier documents plutonium was "ametil" and uranium - "kremnil"). "Test site No. 2" is the Semipalatinsk Test Site. I translated "izdeliye" as "device". On the goals and the program of tests at the test site No. 2 in 1953.
a) A prototype of the "RDS-6s" device with the purpose of carrying a thermonuclear reaction, measurement of the speed and duration of the termonuclear reaction, validation of the calculations that formed the basis for the "RDS-6s" design and obtaining the physical data required for validating the design of a combat "RDS-6s" device. It is expected that the full TNT equivalent of the device will be no less than 250 thousand tonnes. b) An RDS-4 device with the main charge from tellurium-120 with the weight of 4.2 kg and tin-115 with 90% concentration with the weight of 6.8 kg with the purpose of determining the full TNT equivalent of the RDS-4 device with full weight of 1.2 tonnes. It is expected that the full TNT equivalent will be 25 thousand tonnes. v) An RDS-5 device with the main charge from tellurium-120 with the weight of 2 kg with a normal neutron background with the purpose of validating the possibility of obtaining an explosion of the main charge of a hollow design containing 2 kg of tellurium-120 and determining the full TNT equivalent. It is expected that the full TNT equivalent will be 9.2 thousand tonnes. g) An RDS-5 device with the main charge from tellurium-120 with the weight of 0.8 kg with a normal neutron background with the purpose of validating the possibility of obtaining an explosion of the main charge of a hollow design containing 0.8 kg of tellurium-120 and determining the full TNT equivalent. Here is where the first page of the document ends. Apparently, the document continues and describes at least one other test that was conducted in 1953. This appears to be a working document - the paragraphs that describe yield estimates are marked by a blue pencil, as if someone decided that the decision should not commit to specific outcomes of the tests. It is also possible that the the estimated were revised later. The actual yields were indeed a bit different from the estimated in the document. RDS-6s, the first Soviet thermonuclear weapon (this is the "Layer Cake" design), tested on 12 August 1953, yielded 400 kt - 60 percent higher than the first estimate. Apparently there was a reason RDS-6s was considered a prototype rather than a weapon ready for combat deployment. The final three tests of the 1953 series were conducted in quick succession - on September 3, September 8, and September 10. We know that two of them were different versions of the RDS-5 design. The 2-kg core weapon is most likely the one that was tested on September 3. Its actual yield was 5.8 kt - quite a bit lower than the estimate. The 0.8-kg weapon is probably the September 8 test - it yielded 1.6 kt (we don't know what the yield estimate was in this case - it's on the second page of the document). The third device, the one tested on September 10, was probably a version of the RDS-5 design as well - as far as I can tell, there was no other design in the development at that time. The "hollow design" in the description is apparentlymight be what is known as a "levitated core" design with a gap between the core at the center of the device and the imploding shell - at least this is the kind of design that was discussed in 1949. Or it could be the "hollow pit" design, without the solid core in the middle. [UPDATED: It doesn't look like it was the design described in the 1949 documents]. I'm not quite sure what to make of the reference to the "normal neutron background", though. They must have used some kind of a neutron initiator. Overall, this document gives an interesting data point - it is not very often we see documents with amounts of materials used in actual nuclear explosive devices, even though these amounts are not very hard to estimate. Pavel, you mention it as if it's quite a pedestrian discovery, one of mostly historical interest, but unless the Soviet document used decoy values for the masses of the elements as well (as they clearly did for the names of the isotopes), this is an incredible find, and seems to throw into doubt everything we (the internet, the unclassified world) thought they knew about nuclear explosives. Now "A" contains no details but it's probably Sakharov's well-known 'sloika' design, and "B" is a miniaturised implosion design, a more advanced Fat Man. But "C"... this 'neutron background' (a beryllium reflector or something more mysterious?) seems to enable Kurchatov & company to obtain appreciable nuclear yield (whether it was 5 or 9 kt) from a very subcritical 2 kilograms of pu-239! D is wilder still, and suggest that the scientists expect some yield from a mere 800 grams of the stuff. If this is true, then all the 'educated guesses' out there regarding yield calculations for a certain missile's throwweight could be quite wrong, not to mention all the speculation about 'how many warheads could China build with its fissile stockpile'. This could also explain how it was possible for the USSR to build an astounding 40000+ warheads with only 150 tonnes of separated plutonium... how many of us had been wondering about that but didn't dare ask? Is this technology the reason why none of the newcomers to the nuclear club seem to have been able to produce the very compact, yet powerful warheads we've seen the 'big 5' field since the 60s? uvb76: C & D sounds more like the Soviet version of the US test series Ranger in 1951 (although the US used HEU or composite cores). The Ranger tests used the Mk.4 bomb design (an improved version of "Fat Man") with subcritical amounts of fissionable material yielding 1kt and 8kt (http://nuclearweaponarchive.org/Usa/Tests/Ranger.html). The Soviets did here the same with RDS-5. Although the amount of fissionable material were small, the actual device still weighed several tons. These tests were essential to establish the relationship between compression and yield for a given fissionable material. The real breakthrough came end of the 1950's with the UCRL's W-47 warhead weighing ca 330kg (RV excluded) developing a yield of 1.2 Mt, based on an aspherical core shape of the primary.